Did Delta Airlines celebrate its 55th birthday by giving two free tickets to everyone? No, that's not true: It is from a click bait post intended to lure you into visiting a website that is potentially loaded with bad things for you and your computer. DO NOT TAKE THE BAIT and DO NOT SHARE IT. While you may think it is an April Fools Day joke, it appears on to be flying under the joke day radar. Congratulations! You have been selected to take part in our short survey to get 2 Free Delta Airlines Tickets! We have only 374 Tickets remaining so hurry up! One good reason to realize this is fake is that Delta Airlines is 94 years old -- not 55. 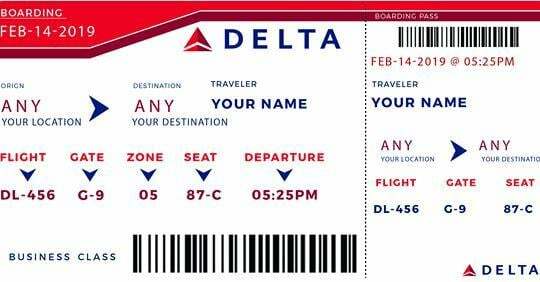 A similar scam has appeared before using the same fake Delta ticket image, according to a Google reverse image search. A travel advice website warned about it in July 2018, suggesting it was a phishing scam to steal your data. Another travel website reported on the free Delta ticket scam in August 2017. I sensed immediately that this was a scam. But I wanted to find out exactly what would happen if I followed through. Fearing the worst, I took the plunge down the rabbit hole and clicked on the link to receive my "free" Delta tickets -- all in the name of journalism. I soon regretted that decision.